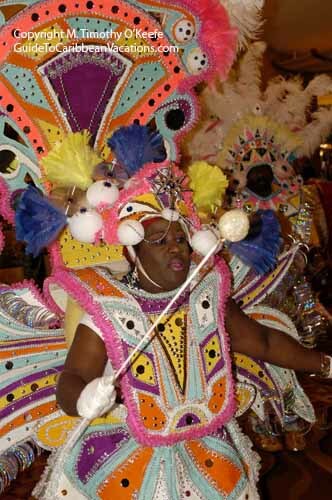 Making a Junkanoo costume is a time-consuming, tedious process that takes skill and creativity. The costume is based on a particular group's theme. Once the theme has been decided upon--not always an easy task--designers create patterns on cardboard that form the basis for a group's costumes. Once the pattern is complete, hundreds of brilliantly colored layers of fringed crepe paper have to be pasted to it. It's this fringe effect that provides texture and dimension to the elaborate costumes.